New York State’s 11 Welcome Centers serve as gateways to the State’s unique regions, highlighting their diverse communities and tourism assets. 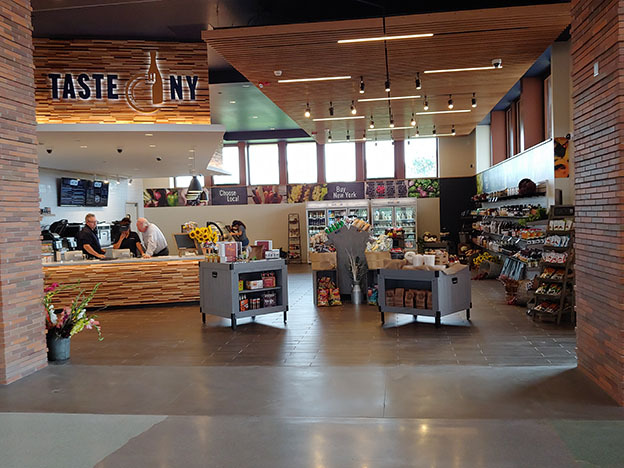 Each of the Welcome Centers feature a Taste NY Market offering locally-made and produced food and beverages and interactive I LOVE NEW YORK kiosks for visitors to discover the area’s local attractions and tourism destinations. By promoting the State's unparalleled natural beauty, rich history and culture, and breadth of recreational opportunities, New York's Welcome Centers allow travelers to see for themselves what makes New York State the Empire State. 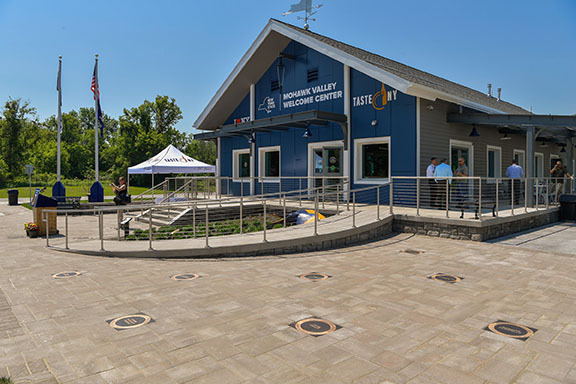 Located along one of the most scenic sections of the Erie Canal and Mohawk River, the Mohawk Valley Welcome Center offers travelers a state-of-the-art, year-round facility showcasing the Mohawk Valley’s rich history and directing visitors to the region’s top tourism destinations. The Mohawk Valley Welcome Center is accessible from the New York State Thruway (I-90) westbound at milepost 187 between exit 28 (Fultonville) and exit 29 (Canajoharie). The Mohawk Valley Welcome Center (formerly the Lock E-13 Living History Rest Area) opened in April 2017. The Western New York Welcome center is inspired by legendary architect Frank Lloyd Wright and represents the gateway to the world-class destinations and historic sites located in the Western New York region. The WNY Welcome Center is located in the Town of Grand Island and between the cities of Buffalo and Niagara Falls, and is accessible from the Niagara Thruway (I-190) exit 19 (Whitehaven Road) via Alvin Road, where approximately 23.7 million motorists travel past this location each year. Parking spaces for cars, buses/RVs, and trucks. The Taste NY Market at the WNY Welcome Center is operated by the Cornell Cooperative Extension. The Community Room at the WNY Welcome Center can be reserved by local community groups or non-profit organizations on a first-come, first-serve basis. To book the community room, please visit Cornell Cooperatives website and fill out the application form . The Taste NY Market will be open 7 a.m. to 7 p.m. seven days a week. The Western New York Welcome Center officially opened in August 2018 . 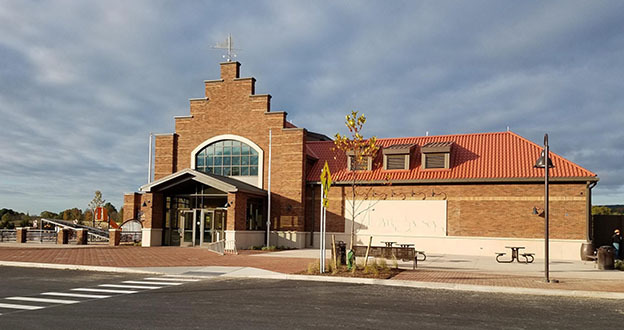 The Capital Region Welcome Center, featuring a historic Dutch-style building facade, represents the gateway into the Capital Region for northbound travelers and promotes the region's local tourism industry, rich history, food and beverages. Approximately 15 miles south of Albany, the Capital Region Welcome Center is located across from the New York State Thruway Authority's New Baltimore Service Area on the Thruway (I-87) between exit 21B (Coxsackie - Route 9W) and exit 21A (Berkshire Section/to Mass Pike). The Capital Region Welcome Center officially opened in November 2018 .